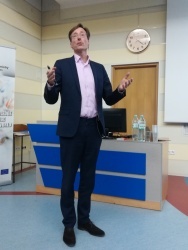 Professor Chris Dainty visited the Institute of Physical Chemistry of the Polish Academy of Sciences (IPC PAS) under a series of cyclical lectures on interdisciplinary emerging research. During his career, Prof. Dainty has investigated problems in optical imaging, scattering and propagation. In these areas, he has co-authored or edited six books, approximately 140 peer-reviewed papers and 220 conference presentations. 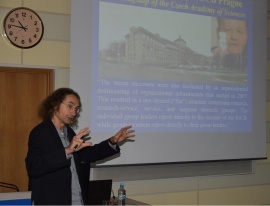 Professor Krzysztof Palczewski visited the Institute of Physical Chemistry of the Polish Academy of Sciences (IPC PAS) under a series of cyclical lectures on interdisciplinary emerging research. The visit took place between 19-20 June 2018 and included planned seminar lecture and several meetings. It was opened with a short welcoming meeting organized by the Director of IPC PAS, to get a general overview of the Institute. 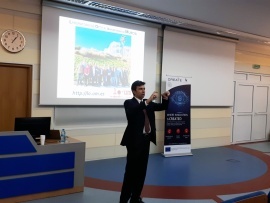 Professor Pablo Artal was invited to the Institute of Physical Chemistry of the Polish Academy of Sciences (IPC PAS) by the ERA Chair holder, under a series of cyclical lectures on interdisciplinary emerging research. The visit took place between 22-24 May 2018 [see annex 1 for agenda] and included planned seminar lecture and several meetings at IPC PAS. 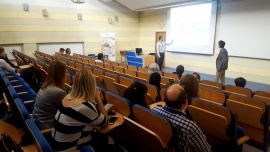 Last day was dedicated to the visit at Nicolaus Copernicus University in Toruń, in a laboratory cooperating with the ERA Chair holder Group. All researchers and PhD students employed at IPC were invited to participate in this seminar – the seminar was attended by approx. 70 people. On the 10th – 13th October, 2017 Prof. Carlos Drummond, from the Centre National de la Recherche Scientifique CNRS, University of Bordeaux came to IPC. Professor Carlos Drummond delivered an open for all IPC researchers (incl. PhD students) lecture: “From fire ants to graphene: some considerations on water-hydrophobic interfaces”. 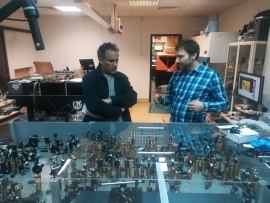 Professor Drummond visited selected laboratories and research groups (incl. department of the ERA Chair holder – i.e. Professor Wojtkowski) which was aimed establishing contacts synergic groups supporting the ERA Chair holder and discuss possibility of future cooperation. On the 20th June, 2017 Professor Luyuan Li, Director of the State Key Laboratory of Medicinal Chemical Biology at Nankai University came to IPC. Professor Luyuan Li delivered an open for all IPC researchers (incl. PhD students) lecture on his studies and trends in scientific research in China. Professor Luyuan Li visited selected laboratories and research groups (incl. department of the ERA Chair holder – i.e. Professor Wojtkowski) which was aimed establishing contacts synergic groups supporting the ERA Chair holder and discuss possibility of future cooperation. On the 19 – 20 October, 2017 Dr. Egidijus Auksorius, from the Institut Langevin, Paris, France came to IPC. Dr. Egidijus Auksorius delivered an open for all IPC researchers (incl. PhD students) lecture: “Full-field optical coherence tomography: from micro to macro imaging”. 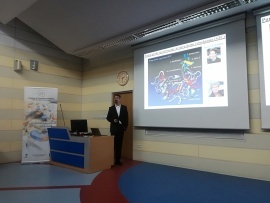 During this seminar Dr. Auksorius introduced several different imaging techniques, beginning with Stimulated emission depletion (STED) microscopy, the Fluorescence Lifetime Imaging (FLIM), which was joined with STED in the experimental system, and then focusing on Optical Coherence Tomography (OCT) and Structured Illumination Microscopy (SIM). 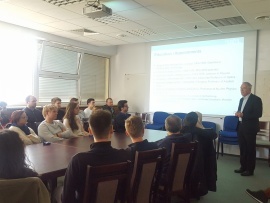 On the 20 – 21 Oct., 2016 Professor Pavel Jungwirth from the Institute of Organic Chemistry and Biochemistry of the Czech Academy of Sciences came to IPC. On the first day Professor Jungwirth delivered an open for all IPC researchers (incl. PhD students) lecture: “Exploring Hydrated Electrons in Non-Conventional and Conventional Ways: From Alkali Metal Explosions to Non-Explosive Ways”. 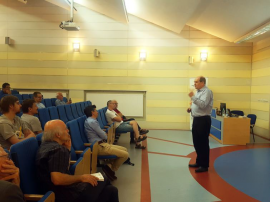 The lecture was aimed at stimulating creativity and curiosity of the IPC society as regards to selected research topics and drawing inspiration for research from everyday life.